Not the best deer land. Not the worst. A good representation of average amount of aerial visible protective cover and grain crop fields. This shows that not all land is large acreage. This is an 80 acre spot. It also does well to show a common mix of aerial visible woody cover and mixed crop land. What cannot be seen is the wooded drainage and much of this entire small lease is not visible from any road or farm yard. No active pasture on it or the adjoining land. The drainage is a year round water source. Key scouting and hunting points. Within unit 8 the common acreage available per hunter is 160 acres or 1/2 by 1/2 mile square. Most deer hunters will have scouted and have stands on 3 to 5 such spots. On any one lease even as small as an 80, 1/2 by 1/4 mile, it is readily apparent there is more need for several stands. The phrase “aerial visible cover” is not loosely applied. It is a reflection that in Kansas there is more deer protective cover than which shows in aerials. Ground level cover to deer eye height of native grasses, plum thickets and general scrub is farm more prevalent than aerials indicate. Units 8 has plenty of bow friendly wooded drainage’s cutting through grain fields connecting many small wood patches repeated many times over. Just to the west is unit 7 that is considered part of north central Kansas. However, unit 7 has terrain of the classic open great plains. These open lands continue to the state line to the west rising up into the high plains that adjoin the Eastern slope of the Rocky Mountains. Those hunting in unit 8 in Republic County are recommended to lodge in Belleville, Kansas. A selection of motels and limited restaurants are available. 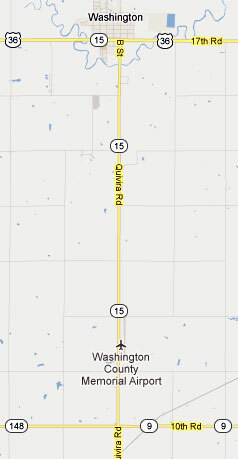 On many maps the mere posting of a town name is little indication of any community or services. 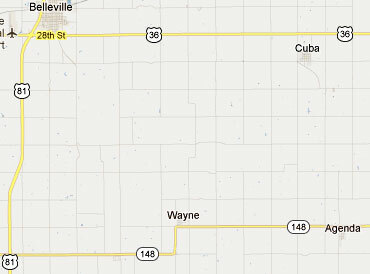 Wayne and Agenda Kansas on this map sheet is such an example. A case where a town exists more on paper or is only a collection of homes. There is much private land for hunting through the Association is easy to 30 minutes drive from Belleville. After learning the land some hunters may choose to lodge elsewhere that will be closer. 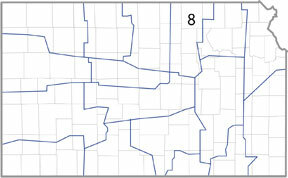 Further east in unit 8 is Washington County. The town of Washington the place to lodge. A selection of motels is available. Restaurants in this community have a history of changing ownership and closures. The difference between Republic and Washington Counties is in Republic County hunting is one the Republican River watershed. In Washington County hunting is inside of the Big and Little Blue River Watershed. In the case of both the Association’s Republic and Washington County land there are small acreage deer leases in adjoining counties. Those scouting or hunting those spots will find lodging nearby. The land that surrounds the bulk of Mid-America’s unit 8 in Republic and Washington Counties is good deer land. The effect is that with the Washington and Republic maps having much acreage within small area hunters are drawn to those counties. That leaves the small acreage map sheets just to the east and south receiving less pressure.